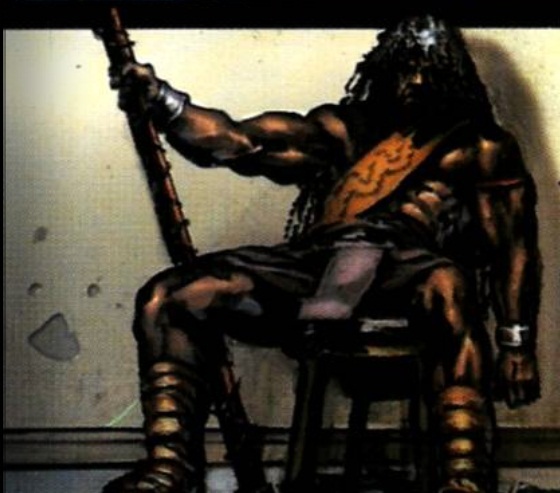 Skills and abilities: Skilled warrior and Wakandan historian. Zuri also possesses peak human strength and endurance. Zuri is a longtime and close friend of the late king T’chaka [Black Panther (1998) #2]. When T’challa was young he often guided the young warrior in counsel and deed. When Klaw tried to invade Wakanda Zuri kept the prince from harm at the behest of the king [Black Panther (1998) #3]. He participated in the border lands skirmish alongside Okoye, Nakia and T’challa after the latter had granted asylum to outsiders who wanted to escape from regional ethnic wars. He also objected when T’challa thought it was wise to leave Wakanda during this time of upheaval. [Black Panther (1998) #1]. Despite his objections he accompanied his king to America. Once their he found the adjustment to American culture very hard, often finding himself in situations where he misinterpreted what was actually happening; like a mud wrestling match which landed them in jail [Black Panther (1998) #2]. He fought Thor [Black Panther 1998 #8] and the two later bonded and became friends [Black Panther (1998) #9]. He helped battle Achebe and returned T’challa to his throne [Black Panther (1998) 10-#12]. Zuri also tried to stop anyone from interfering with Killmonger and T’challa’s fight [Black Panther (1998) #20] If they had listened Killmonger would never have temporarily become the Black Panther. Years later he died in battle alongside W’kabi after T’challa was at death’s door and Shuri had been rejected as the Black Panther by Bast. He died a glorious warrior’s death at the hands of Morlun. His sacrifice managed to buy Shuri enough time to gather her wits and don the Black Panther Mantle [Black Panther (2009) #5]. ← New shot of Michael Jai White as the Bronze Tiger!